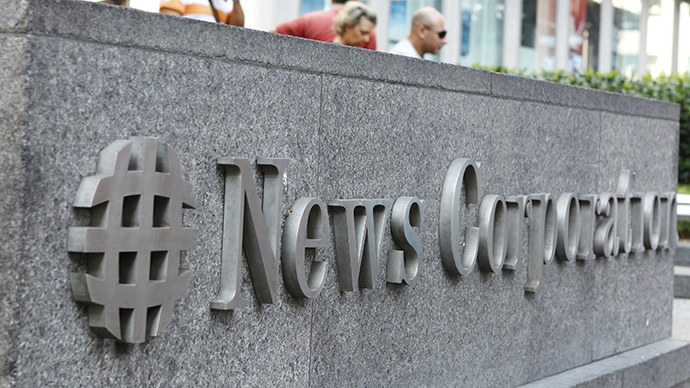 A man shot himself in the chest outside the News Corporation building in midtown Manhattan. The former employee of the company had been protesting Fox News before he killed himself, according to reports. The man, identified as Phillip Perea, was handing out fliers, saying his former employer had “ended my career” and that the news channel had ruined his life, a police official told the Wall Street Journal. The 41-year-old had previously worked at a Fox News affiliate in Austin, Texas. The Journal, also owned by News Corp., is in the same building. Security guards asked the man to leave and when they turned around to walk back inside, they heard a gunshot, a source told the New York Post. Unconfirmed but word is someone handed security guard a note then went outside and shot himself in front of my Fox News office. Unconfirmed. A suicide note was found in Parea’s pocket and a small-caliber pistol was next to him, police said. Videos uncovered by AOL News titled ‘The American Workplace Bully: How FOX News Ended My Career’, “paint the picture of a disgruntled former employee who he believes was outed as part of a master plot against him,” the online news organization reported. About an hour before his death, Perea tweeted more criticisms of his former employer, and linking to one of his 35 YouTube videos railing against Fox News. The eight-minute video laid out his complaints against the channel. He was found unresponsive outside News Corp. headquarters, and was rushed to Bellevue Hospital Center. He was pronounced dead an hour later, police said. The suicide comes only a day after a murder-suicide involving coworkers at a Home Depot just 23 blocks south of Monday morning’s incident. Perea was a promotion producer at Fox affiliate KTBC, and teased a story on Facebook in February that showed a crying jaywalker being arrested next to a picture of Austin Police Chief Art Acevedo reacting to the viral video. Perea’s bosses at the station thought the photo of Acevedo was “more sensational than informative” ‒ in part because the police chief didn’t like the image, the Austin Chronicle reported. The producer was set to be suspended three months later due to the incident, as well as alleged inappropriate behavior and an alleged general inability to follow directions, according to the Chronicle. Perea was subsequently fired.